Check the Routes by Country/City page for more great routes! If you have the good luck to be going to Sydney, it's time to get down on your knees and thank the Great Spirit or your own great fortune that you will experience this most livable of cities. Sydney combines gorgeous scenery, nice weather, lots of water and beaches, and a laid-back lifestyle that will captivate you from the first minute you get there. And, of course, it's loaded with great jogging routes. The harbour (that's what they call the fiord-like bay) provides endless vistas of nice, waterfront neighborhoods, sailboats tethered in coves, with cliffs, rocks and beaches. And the ocean coastline north and south of the harbor mouth also provide a stunning mix of cliffs and beaches. I have worked there a few times, on one project for a whole month. There are a hundred great routes: just get out there and run, and you'll find your heart flying like a bird. But here's a route that not everyone discovers: running along the North Shore of the harbour. 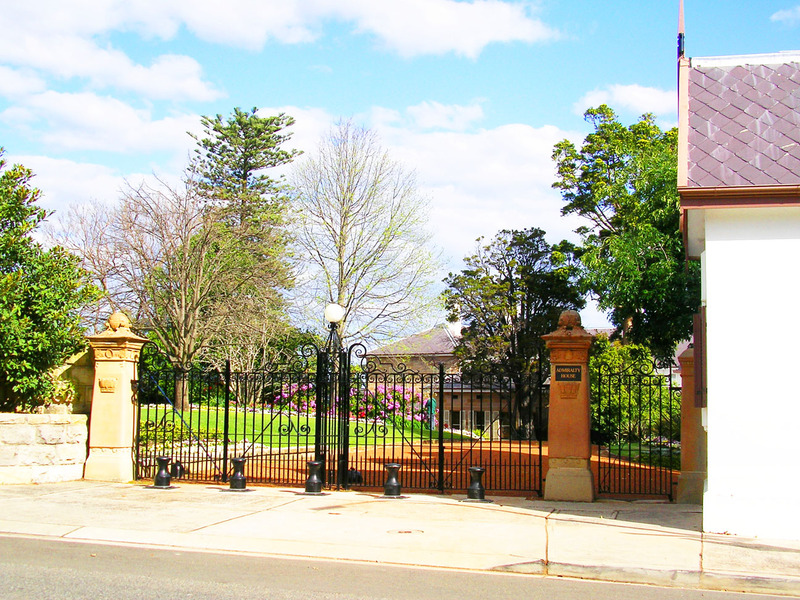 It provides a constant change of beautiful homes, parks, boats and rocks, with a view of the main city across the bay, with the opera house and the Harbour Bridge crowning the horizon. You can run the route, then run back the same way, or simply take a ferry home at one of the various ferry landings (a great experience in itself!). The point of the run is to follow the water, zigzagging along the coves. Personally, if I were in the Central Business District, I'd just run across the Harbour Bridge and enjoy the great view from up there on the way to the North Shore. But let's assume that you got to Milson's Point at the foot of the bridge yourself (there is a ferry landing right here, just a quick ride from the main Circular Quai ferry terminal across the harbour). So you now find yourself standing next to the public pool at the entrance to the Luna Park amusement center. Looking at the water, just turn to the left, following the footpath, with the water on your right. 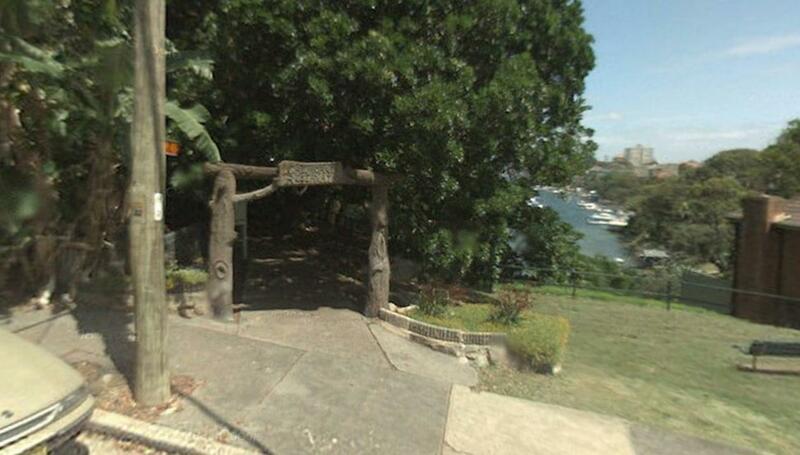 The path will end in a neglected park very quickly, and you'll need to go uphill to the next street, Kirribilli Ave. Follow it to the right, and you'll run by the British Governour General's mansion-house, and continue around on Carrabella Street, keeping as close to the water as you can by going downhill on Peel Street to Elamang Avenue. At the Sydney Flying Squadron (home of the wild sailors who invented the notorious Australian skiffs, not pilots! 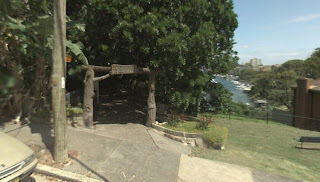 ), cut across Milson Park at the end of the little cove. 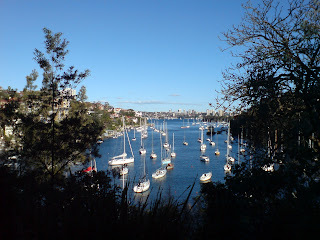 Run northeastwards on Hipwood, then along Clark Road, up and over the promontory separating the cove from Neutral Bay. You will run right to Neutral Bay. 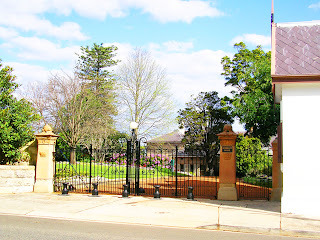 Cut across its park right at the water, and go uphill again on Kurraba Road. Turn left at Billong Road, which quickly connects to Shell Cove Road, where you turn left again. If you see the footpath going down to the park at the end of the cove, you'll have a nicer route. Otherwise follow the road around the end of the cove and hit the park from there. Once in the park at Shell Cove, you'll begin my favorite part of the trip: the Cremorne neighborhood. 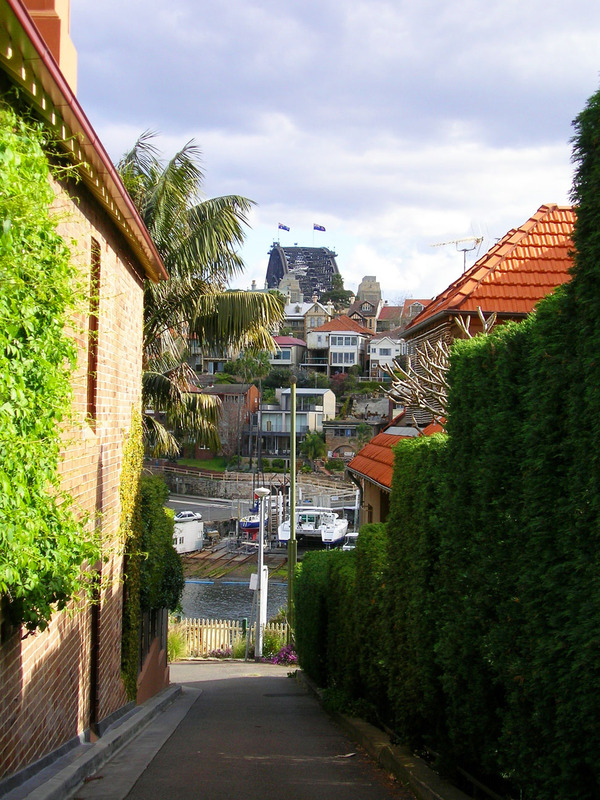 The houses are pleasant and the landscaping sloping down to the shore is stunning. Just follow the footpath along the cliff overlooking the water. 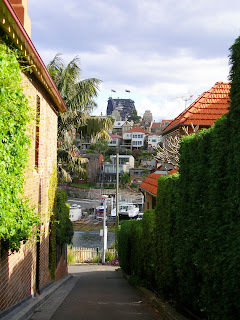 Once you get to the south end, at Cremorne Point, there's a small park where you can climb down the ladder at the lighthouse, and amaze yourself with the rock formations carved out by the winds. You can even cool off with a swim here, but be careful of cutting yourself on the mussel-covered rocks. 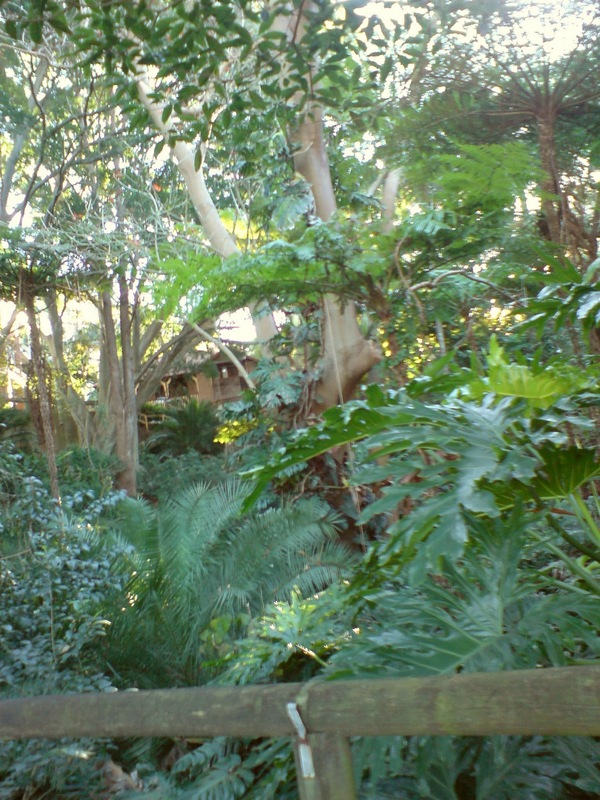 Heading north along the shore on the east side of the Cremorne peninsula, the scenery gets even better: residents have lovingly created jungle gardens along the water, and you can explore their footpaths as you please. Don't miss it! 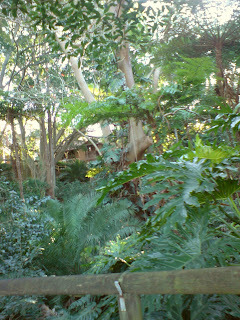 You'll never want to leave your newly found jungle paradise. Once you do finally get moving again, heading to the head of Mosman Bay, you run through a beautiful woods, which ends at a marina and ferry landing. Either turn around here, or take the next ferry back, or continue on past Serius Cove to Taronga peninsula, where you can visit the great zoo, or take a ferry from there. I am lucky enough to live in Sydney and can endorse everything said about this route. It actually gets even better if you go a bit further round past Middle Head. However, you then have to get the bus back! North shore running rock, I'm very lucky to live in Neutral bay and enjoy this running/walking track every day :) if you want something a bit more exteme or even more exciting, try the spit to manly walk/run trail ... BREATHTAKING :) if you want to run it though you should head out early as it can get busy with hikers and walkers during the day and there aren't many spots to overtake someone. You're lucky indeed, Thomas. I wish I could join you there for a few more runs along that beautiful shore. Looks like this particular North Shore trek has picked up a lot of interest since the blogpost has been put up huh? Thanks for the headsup Thomas! I hope to be able to do the run on my own as well one of these days! You are lucky enough that you had few more articles from your side.